Motorcycle Riding Gloves; choose the best for you. Here's what you need to know to choose gloves that perform great and come with the features you want to increase your riding comfort,safety and enjoyment. Your motorcycle riding gloves should feel comfortable. And they should keep you comfortable when you encounter hot sun, cold winds, drenching rain and other rugged riding conditions. By keeping you comfortable, your motorcycle riding gloves help you to stay alert and safe. Your gloves are your hands' primary line of defense. They must protect your hands against routine scrapes and bruises caused by flying rocks, gravel, bugs, birds, small rodents, junk thrown from cars and other airborne objects. And they must protect your hands if you have a motorcycle accident -- even a minor accident. When things go wrong, a good pair of gloves can make the difference between debilitating damage and no damage at all to your fingers, knuckles, palm or wrist. 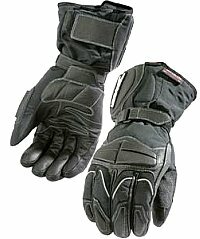 Even well-insulated gloves should enable you to feel and operate your motorcycle's hand controls easily. They should allow you to keep a firm, non-slip grip on your accelerator and to flip switches, push buttons and pull levers easily. 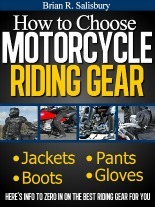 Lots depends upon your motorcycle riding gloves, so it's important to carefully consider all of your options. That's the best way to make a solid decision regarding the best gloves to give you the most comfort, control and protection. If you're like most motorcycle riders, you'll need two or more pairs of gloves to provide comfort and protection across three or four seasons and a variety of riding conditions. You'll see that these three types of gloves have overlapping qualities and features. 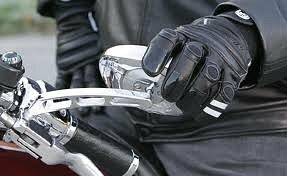 You need summer/hot weather motorcycle gloves to protect your hands from serious injury while also keeping them cool and well ventilated. Look for summer gloves that give you padding and protection in the right places but will not make your hands uncomfortably warm. Glove manufacturers do their best to balance protection and ventilation by doubling up protective material on slide/impact areas and adding lots of vents or airy material in less vulnerable sections. They also use high-tech materials such as Kevlar to give you thin, light-weight strength and protection. 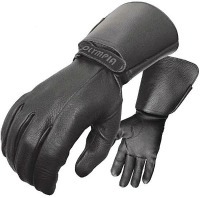 Medium weight gloves are your best choice for spring, fall or mild winter riding. You'll find them in many different styles. They’re warmer than summer gloves because they're less ventilated. Also, many medium weight designs surround your hands with a thin insulating layer. Winter riding gloves are built much thicker than medium weight styles because --obviously -- they're designed to keep your hands warm and dry during very cold, wet weather. You can also get heated gloves. 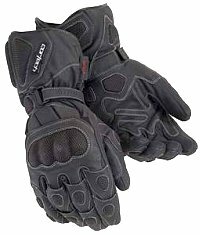 You'll want motorcycle riding gloves that give you sufficient padding and insulation to retain heat. However, too much padding can make it tough to feel and operate your bike's controls. Look for winter gloves that give you comfort and protection without sacrificing your dexterity. Test them out on a bike's handlebars. Make sure you can work the controls, push buttons and flip switches with them on. High-tech materials used to make motorcycle riding gloves and continuing advances in glove designs will help you to zero-in on a few pairs that match your particular riding demands. 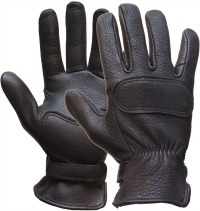 Most motorcycle riding gloves are made primarily of leather. Some -- usually winter gloves and summer styles -- are made primarily of very strong nylon or other textiles. Either way, you're okay when it comes to choosing leather or textiles as a glove's primary material. But realize that leather by itself will protect you better than nylon if you hit the ground. Nylon gloves need added crash protection such as strategically placed pieces of Kevlar or other impact-absorbing materials. Gore-Tex and similar micro-porous textiles create a waterproof, breathable barrier to keep your hands dry. They prevent rain and moisture from entering while allowing moisture to vent out and away from your hands. Kevlar, titanium, carbon fibers and other tough materials protect high impact areas such as your knuckles and finger joints. Silicone gel padding added to a glove's palms will cushion your hands from handlebar pressure and vibrations. It also provides crash protection wherever applied. Thinsulate and similar materials give you warmth without bulk. Among the many types of gloves available, my choice for everyday riding gloves are deerskin motorcycle gloves from TOurmaster. I find that these deerskin gloves give me lots of comfort, control and protection. Click here to get all the details about them. Waterproof lining -- Parking under a dangerous highway underpass to dig out your rain gloves is a bummer. And riding with cold, wet hands is a rotten way to go. Look for high quality gloves that have a waterproof lining made of Gore-Tex or a similar lightweight, breathable material. 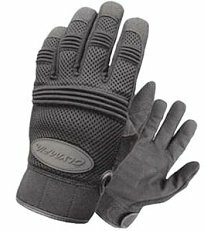 Crash protection -- Look for gloves that have ample padding on the palms and knuckles. You might want the extra protection of Kevlar, carbon fibers or titanium studs on high impact areas. Gauntlets -- These extensions on the top of a glove are called gauntlets. They're intended to cover the end of your sleeves and keep the wind out. A disadvantage is that rain can run down your sleeve, under the gauntlet and into your glove. Also, if you wear a thick coat, the gauntlet might not fit over your sleeve. However, gauntlets are a nice feature -- even if you must tuck them under your sleeves when it rains. Insulation -- If you plan to wear your gloves across a few seasons, and especially in the winter, look for a pair that's adequately insulated with Thinsulate or a similar light-weight material. You may want your multi-season gloves to have a waterproof Gore-Tex lining as well. Ventilation -- Keeping your hands cool or at least well ventilated in hot weather requires a glove made with strategically placed airy materials that don't sacrifice protection. Another ventilation option you might like is air-catching vents built into hard protective surfaces. Lining -- Some gloves have a removable lining you can take out and wash...and some have heated liners. Another option is to wear a separate silk or micro-fiber lining that adds warmth and increases your gloves' versatility. Reflective material -- Reflective seams or stripes on a glove increase your visibility when driving at night. They're a nice touch. Wrist straps -- Wrist straps improve your gloves' comfort by snugging everything down and keeping the safety padding in place. They also hold your gloves on if you have an accident. Look for gloves that have sturdy, non-elastic wrist straps that won't come undone if your hand slides on the ground. Workmanship -- You can't go wrong when you look for high quality workmanship. If you prefer leather gloves, make sure they're made of high quality leather. For all gloves, make sure they have straight seams and tight, concealed stitching that won't shred if scraped on the road. Protective padding should be positioned properly and firmly over high impact areas. You'll definitely want to try on a number of gloves to zero-in on a style, make and model that suits you just right. Some manufacturers' styles and models will fit you better than others. However, to get a pretty good idea of your glove size, place a tape measure under the palm of your right hand and measure from your index finger to your pinkie. Try the larger size glove first if your measurement falls between two sizes. Once you get yourself a new pair of motorcycle gloves, always wear them when you ride -- even when the weather is hot. Gloves are your best insurance against hand injuries.